I’ve said before that I’m never really sure what’s going to get my readers going. Sometimes I spend days researching a post, write it, and hardly get any page views. Friday’s post on the seven candidates for State Superintendent took me about 30 minutes and was my 400th post to this blog. As I write this, it’s ranked ninth among the 400. Another interesting thing to watch is the clicks from my blog to other sites. I try to source external content as much as it is available. 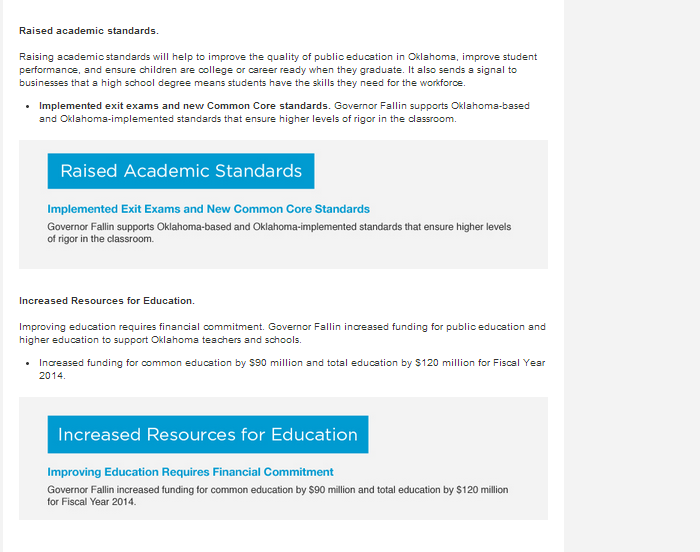 The stated purpose of this blog is “when the record on public education in Oklahoma needs to be set straight.” It says so right at the top. 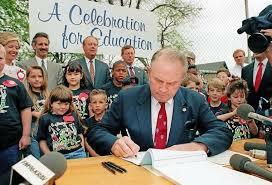 I try to refute the favorite myths of the people trying to destroy public education. This often involves simply re-posting press releases or testing instructions directly from the SDE with very little commentary. When I do, those items get a few clicks, typically. That’s why I’m so pleased that my readers have really taken the opportunity to research the candidates in this race. As of 8:45 tonight, here are the total clicks from my blog to their websites. Just from what I’ve seen in social media over the last 9 months or so, I think most of my readers are familiar with Hofmeister, Deskin, and Barresi. I also think few would seriously consider voting to re-elect Barresi. Then again, I also know I have quite a few readers all up and down Lincoln Boulevard, and honestly, they’re not all fans. So maybe a few of my regular readers will be voting for Barresi. Good for them. While I’ve yet to settle on a single candidate, and I really don’t have plans to endorse one, I’ll go ahead and say this: ANYONE HAS TO BE BETTER THAN BARRESI. For more than three years, that has been how she has “led” the state. Blame educators for everything. Tests fail; it was the schools’ fault. Kids are stressed about tests; the adults let them down. Losing a damn generation of kids doesn’t happen because the teachers are heroes, as she says when she’s right in front of them. Recently, Barresi (or her people, anyway) wrote about the “New Minimum” in academic preparation of students for college and the workforce. It was such an unremarkable rehash of ALEC claptrap that I found it entirely unremarkable. This weekend, however, when I was watching the numbers go up on my post and on click to the campaign sites, I realized that so many of my readers have that same mindset when it comes to this election. We have a new minimum. While I find some of the candidates less ready for the state superintendency than others, any of them would be an upgrade over the incumbent. For a “contrary” point of view, read Rob Miller’s Top Ten Reasons to Re-Elect Janet Barresi! You can click the links above to learn more about each candidate from his or her own website. With three or more individuals in each party’s primary, it is important to note all three election dates. The primary will be held June 24, 2014. In the case a run-off is needed, it will be August 26. The general election will be November 4. Keeping track of candidates over the last three days has only been part of my curiosity. I assume that most of my readers have never run for public office before. I wanted to see what the process looks like, so I downloaded a copy of the 2014 Filing Packet. First off, each candidate had to pay a filing fee of $500, unless they presented a petition for candidacy that has been signed by four percent of registered voters. Second, each state office has specific requirements for candidates. Here’s a general overview for state offices. Some offices have additional requirements. The State Auditor and Inspector must have had at least three years’ experience as an expert accountant. The Insurance Commissioner of the State of Oklahoma shall … have had at least five (5) years’ experience in the insurance industry in administration, sales, servicing or regulation. Any person, otherwise qualified, who has been a resident of the state for two (2) years, a registered voter in the district and a resident residing within such district for at least six (6) months immediately preceding the filing period, a duly licensed attorney for at least five (5) years, and at least twenty-eight (28) years of age, prior to the date of filing for the office, shall be eligible to hold the office of district attorney. Each District Judge shall have had prior to election or appointment, a minimum of four years’ experience as a licensed practicing attorney, or as a judge of a court of record, or both, within the State of Oklahoma. That’s it – nothing for Attorney General, State Treasurer, or Superintendent of Public Instruction. You have to have experience in law to be a DA, but not to be the AG. Bizarre. You just have to be 31. Most of the Oklahoma education community has lamented over these last three years the fact that our state’s education system is being run by an amateur who takes her marching orders from Jeb Bush and ALEC. Many of us would like to see some sort of professional prerequisites for this office as well. While we are fortunate to have an Attorney General and a State Treasurer with relevant professional experience, nothing in the Oklahoma Constitution or anywhere in state statute mandates that. In theory, we could eventually get dentists running both of those agencies at some point as well – maybe even teachers! In all seriousness, this field has been taking shape since August. I’m a little surprised we didn’t have another candidate or two. Oklahomans (not just educators) are beyond frustrated with the incumbent and legislature for their ongoing disrespect. Throw the governor in there too; she hasn’t done public schools or the children they serve any favors. My hope is that concerned voters will research ALL of the candidates. These people have done something in putting their names on the ballot that most of us will never do. I’ll be the first to admit that I have a strong working knowledge of four of these people and their positions on the issues that matter to me. Now I need to learn more about the other three. We have 74 days until the primary, and a lot of work to do.